The bungalows from the early twentieth century (c. 1890-1930) we in America refer to as 'Craftsman' houses are often now, in the twenty-first century, landscaped with rocks and grasses. While this looks appropriate and somehow natural and even beautiful to our eyes, it is certainly not what a gardener of the time period would have used in the landscape. 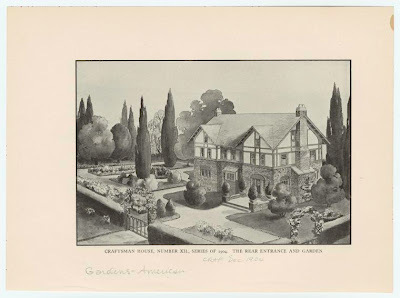 A more historically sensitive garden could be drawn from images like that above, also from the New York Public Library collection, circa. 1904. Note the wide paths used to segment the lawn, which is designed to be in, not just to gaze at. Healthy time in the out of doors was an important part of Arts and Crafts philosophy. Tall evergreens, so popular in the preceding Victorian era, are still used to frame the house, but the area around the entrance is accented by only small trees/large shrubs so as not to obscure the entrance, a point modern homeowners would do well to take note of. The entrance to the house is, in fact, the most prominent feature in the landscape, being extended by a porch and emphasised by the wide path-crossing in front of it. Color is provided by the planting beds within the lawn segments, formality by the judicious use of shaped evergreens, privacy and enclosure by the encircling hedge, and the arbors are an appropriate nostalgic touch for what was, after all, a nostalgic movement. Which is why a modern garden doesn't really suit. "Craftsman house" just drew me right in, because I would love to live in one of those early Craftsman homes. They're so charming and cozy feeling. Interesting post! Sounds like they got some utility out of their lawn. Today, they serve mostly to guzzle water, not a great idea in water thirsty California. Is this style a predeccessor to the suburb, or were these type of homes still part of an urban center? Great post. In California the movement got very specific, directing the homeowner to use only certain muted colors for trim on homes, burlap curtains, etc. Plantings were more natural looking too. That is the back of that house ("back entrance" it says) in the card, btw.